God's Gifts...Explored...thank you., originally uploaded by mrsjstoy. I had a hard time deciding between this image and the color version, which reminds me of the classic painting "Anna's World" by Andrew Wyeth. 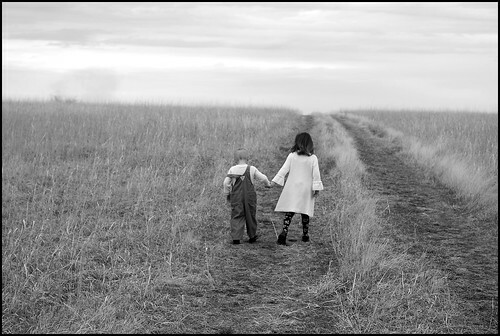 I ultimately decided on this black-and-white, because it reduces the picture so well to the converging lines, and the slightly off-center images of the boy and girl traveling down them. Photo by mrsjstoy.